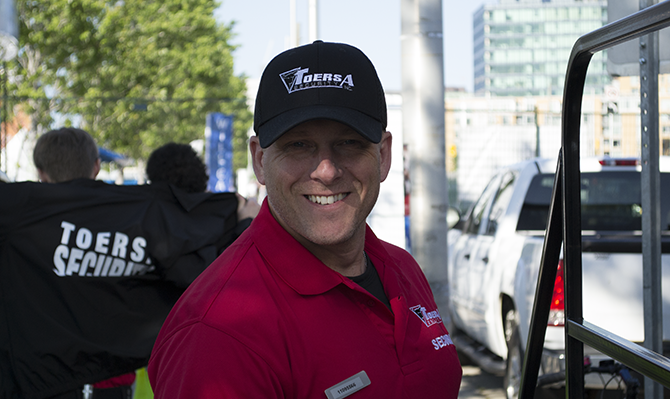 TOERSA security is a leader in protective solutions, we offer services that are capable of adapting and matching all your needs in order to protect your business and the assets you greatly value. We ensure that our guards are professionally trained with CPR/ First Aid. We also encourage that they have Smart Serve and Non-Violent Crisis Intervention. Bar and Nightclub security has a very negative connotation in todays society. Here at TOERSA we strive to change that image and change the face of Bar and Nightclub Security. With proper training and a focus on customer service, our guards are able to not only ensure that your patrons are safe but also ensure that your business continues to grow. Our guards are able to greatly reduce your risk and liability through our methods. With over 20+ venues on our roster we bring experience, knowledge and a proven system. Whether you need help keeping unauthorized personnel out of construction zones and vacant lots or promoting safety during crowded events, our trained security staff can help reduce your liability and save you money. Our guards are trained to notice changes in the work environment. We take a proactive approach in an effort to prevent problems. To ensure customer satisfaction, we aim to resolve issues before they escalate and become a problem. As an employer, you likely feel as though you need to be present at all times to ensure that everything is safe and secure. We understand. By having TOERSA help with your operations you can rest assured that trained professionals are keeping your site secure. Our guards are available to monitor and patrol your site around the clock. Revenues from admission are another major source of income for events, concerts, shows, and festivals. Qualified security guards posted at points of entry help to ensure that patrons gaining access to the site possess proper tickets, identification passes or other admission credentials. Further, the control of which objects are permitted to be brought into the building or site is essential to the safety of patrons. Proper screening at access points will help prevent weapons, alcoholic beverages, illegal substances, and other objects from being brought into the site. Ultimately, effective access management systems are important to the success of an event. Whether it is vandalism and/or natural disaster, TOERSA Security can provide emergency response personal immediately to your location with services provided on a 24-hour bases. Our guards are trained and capable of handling numerous types of emergencies and are able to work with your team to insure the emergency is taken care of safely and efficiently.